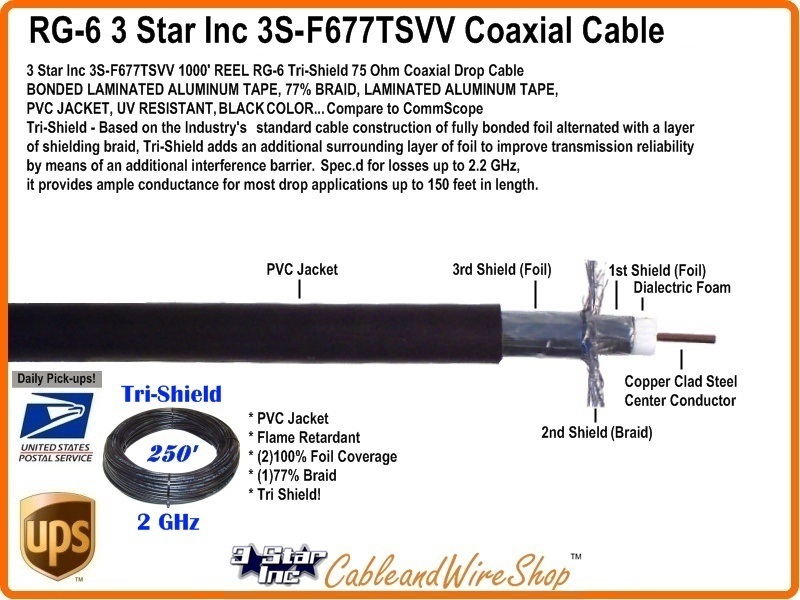 Tri-Shield - Based on a Tri-Shield standard cable construction of fully bonded foil alternated with a layer of shielding braid, Tri-Shield adds an additional surrounding layer of foil to improve transmission reliability by means of an additional interference barrier. The industry standard workhorse, it provides ample conductance for most drop applications up to 150 feet in length. This is the same Commercial Grade Low Loss Cable your local Cable TV company and Satellite TV Professionals use to wire your House for Service in a 250 foot roll (vs 1000 feet). Our Customers use this in their Home to distribute Satellite TV, Cable TV, TV Antenna to individual TV Set's and Cable Modem locations in short run segments. We offer these RG6 cables with connectors made in various lengths to facilitate connections of the new Cable TV Antenna and Satellite TV Accessories we Sell here at 3 Star Inc. Each Cable is made from Quad Shield cable, with High Quality, Low Loss Connections. Made with Black Colored Jackets, from 25 to 200 feet in length. RG6 (RG-6 or RG-60) is the most commonly utilized 75 Ohm flexible braided shield coaxial drop cable in use by the CATV (Cable TV), TV Antenna and Satellite TV Broadband Industries today. When used in common distribution lengths of around 150 feet, it provides the best combination of Signal loss versus size and diameter; the later being of importance when navigating the small spaces afforded most chases and wall-plate boxes. RG6 Cable featuring 60% Braided Shield is comprised of an Aluminum Foil bonded to the Foam Dialectric with Aluminum Braided Shield with 60% coverage. Quad Shield RG6 would denote alternating Aluminum Foil and Aluminum Braided Shield Layers, starting with the Bonded Foil Layer around the Foam Dialectric, with the best Quad Shield having 2 Layers of Braided Aluminum Shield, one of 60% and the 2nd at 40%. Tri-Shield RG6 will have 77% Braided Aluminum Shield Coverage Between 2 Layers of Aluminum Foil Shield, the 1st Foil Layer being Bonded to the Foam Dialectric. RG6 is lower in loss when compared to RG59. Use for distances of around 150 feet or with appropriately placed Drop Amplifiers as necessary. For Cable with less loss than RG6, one would then have to avail themselves to RG11 for suitable placement. Most all RG6 Manufactured uses Aluminum Braided Shield, the difference of note being the amount of Aluminum Braid Coverage and the composition of the Center Conductor; Solid Copper vs. Copper Clad Steel. 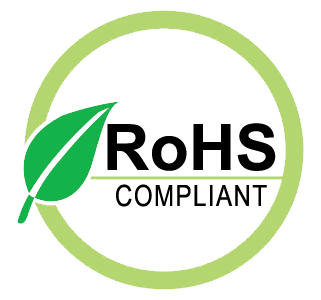 Copper Clad Steel will suffice in almost any utilization scenario, however most Satellite TV Operating companies will require Solid Copper Center Conductor to be used by their respective Sub-Contractor Installers for Maintainence and Warranty issues. This is due to the DC Voltage component being fed from the Receiver back to, and Powering the LNB(f)s mounted on the Satellite Dish. Unless the run is extremely long and the connectors applied are of dubious Quality, the DC Loop Resistance difference between Solid Bare Copper and Copper Clad Steel is negligible.